Another Yeezus-inspired album cover (or rather "lack-of-album-cover"). 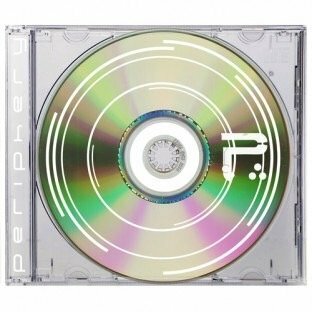 Progressive metal band, Periphery, released their second album back in 2012, a record that I was enamoured with for its melodic take on “djent” (Read here). The band have since recorded a new EP, which dropped yesterday. Are the band still as kickass as they were two years ago? For this review, I have decided to collaborate with avid metal fan and chairman of Hell, Satan. A week ago, I asked Satan to review the latest record by progressive black metal band, Murmur, and since he did such an impressive job, I thought it might be an interesting feature to include his input in each of my future metal reviews. Satan and I go way back. We’re good friends, aren’t we Satan? Friends? I wöuldn’t gö that far. Okay, well, we’re good acquaintances, aren’t we? I dön’t dö friends. I dön’t dö acquaintances. Especially with petty mörtals. Right ...er ... well, never mind then. What did you think of this EP, Mr. Satan? Its Satan. Nöt Mr. Satan. This EP was an abömination. Simply wasn’t evil enöugh för my liking. The lead singer just söunds like a möre melödramatic, whiny versiön öf Chester Benningtön fröm Linkin Park. His vöice makes me want tö rip my face öff. The percussiön has been pröduced tö sound like a blöödy drum machine. Might as well just use a drum machine and kill öff the drummer. This is överpröduced pöp metal för pussies. Okay, well, that’s certainly a rather harsh analysis. I must agree, the band have got much more melodic, but for me this has improved their sound. I thought every track felt distinct from the next. I particularly like the instrumentals on this album. "Zero" – which does offer some satisfying heaviness – has an awesome progression in it that reminds me of Tyler the Creator’s “Jamba” of all songs. As for Spencer Sotelo’s vocals, I thoroughly disagree with you, Satan. He doesn’t sound whiny and I think his voice fits the music perfectly – as melodramatic as it might be. He has a lot of energy and really knows how to hit those sweet notes. And what aböut his lyrics? What aböut that silly chörus ön the secönd track? : “cöldest nights sömetimes give way tö brighter skies öf blue”. Yöu can’t seriöusly tell me yöu’re intö all that spiritual, pröverbial böllöcks? Where's the fire and brimstöne? That mother nature stuff makes me sick. The lyrics are a tad corny, there’s no denying that. But honestly, who listens to prog metal for the lyrical content? The genre celebrates impressive musicianship. At least that’s how I’ve always approached prog metal. Okay. And what would that be? Periphery are blatant sell-öuts! They’ve göt way töö big a föllöwing tö be a respected metal band. I like my metal albums tö have that undergröund feel, like they were recörded in a shed ör sömething. I like my metal bands tö önly have a small föllöwing. I like my metal to be less … less ... less mainstream! Periphery aren’t kvlt enöugh. They’ve göt far töö big a föllöwing. I dön’t föllöw big fads. I’m a löne wölf. Nöt a sheep. Yöu wöuldn’t understand. 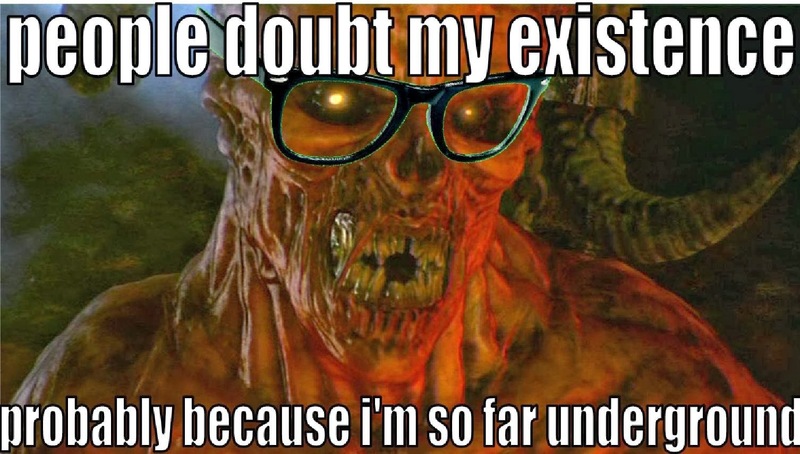 I’m way töö individual tö be understööd. I eat töfu and ökara and öther cultured fööds yöu pröbably haven’t heard öf. I drink mead and listen tö cassette tapes and write with a quill and wash my clöthes by hand. Yöu wöuldn’t understand. Right. Well, thank you Satan for your insight (hmm, it would appear Satan is a full-blown metal-hipster). I personally found Clear to be a real thrill. Periphery's sound, I feel, has grown more dense and colourful – the pretty parts prettier, the brutal parts more brutal – and there’s more of a symphonic feel (the Dream Theater influences are clear to see). Their music can feel a bit OTT in places (I still think UK band Tesseract are the melodic djent kings of the moment) but they’re a darn sight better than the likes of Veil of Maya and Born of Osiris and most other prog/djent/metalcore acts. “Feed the Ground” is probably my favourite track. Do check this record out!